You may know that I love to roast vegetables in the oven. That is my favorite way to cook them and my favorite way to eat them. Roasting is so easy to me. I can wash and chop/cut then put it in the oven with a timer (that is the key, because I don’t really want to “forget about it”) and then go do something else. I have been craving zucchini lately. Roasted zucchini slices. Even though I enjoy cooking, I am not great at it. I don’t have knife skills at all. In fact when I am using a knife I always hear my friend telling her daughter to hold the knife properly because the daughter was using her index finger on the top of the knife and that is how I cut. It helps to keep my wrist aligned, but apparently it is not the proper way to hold and cut with a knife. 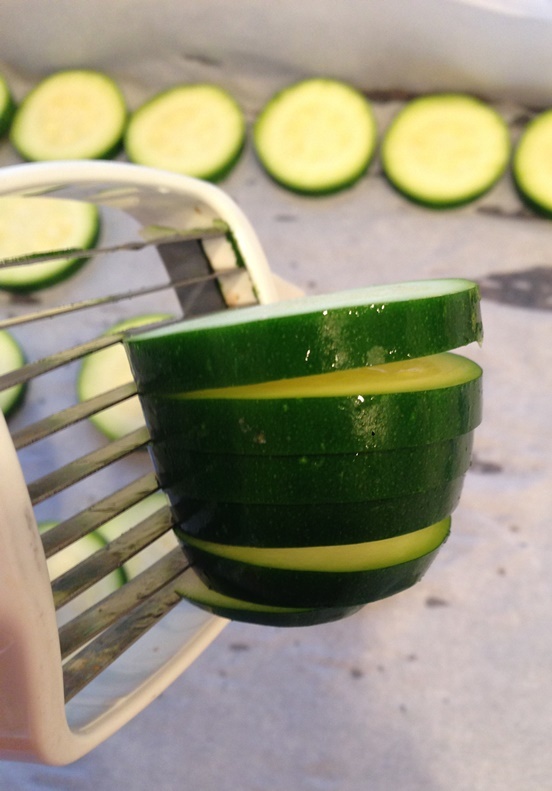 So the explanation about my knife skills – or lack there of – leads me to my zucchini slices. I don’t always cut them all evenly. If I take a lot of time I can do them even, but by the time I am wanting to throw the veggie in the oven I do not have a lot of time so I want to do it quick. And quick is when they become very uneven. When they are uneven some end up burning while the others are not cooked. A couple of weeks ago I realized I could use my mushroom slicer. I know, I know, this is one of those things where I am very late to the party and many of you know this and probably do it. But I am confident not everyone has thought about it. Sometimes I think of things to post about and I decide not to because I think everyone knows it. But then I read a blog post or I watch one of those “life hack” videos and I realize that even though I have known that particular thing “forever” not everyone does. It is a good idea to share and those that know can comment or just ignore it and those that don’t can learn something new, right? 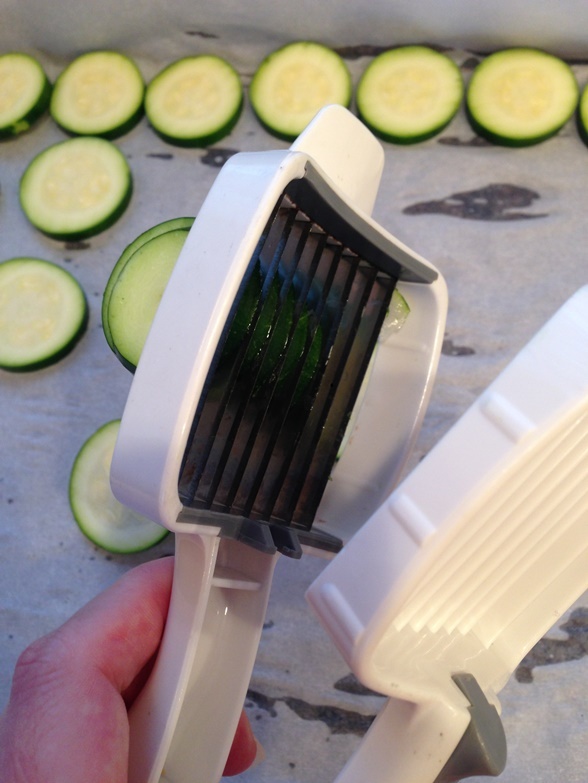 So I cut the zucchini the size of the slicer and then — push, wiggle (I have to wiggle them out of the slicer) – voila! They are all the same size. There are a few that get cut a little thinner because it might not be perfectly in the slicer, but way less than when I slice by hand. AND it is done so much faster. I am sure they even have a slicer like this named a zucchini slicer or a vegetable slicer. They have so many gadgets for so many things! I know people have used egg slicers for mushrooms. I am sure for other veggies too. The reason I like this particular mushroom slicer is that is has blades and not wires. I think I had a wire one and it broke. So I was excited to have found this one. I don’t even remember where I got it! I have been enjoying a lot of zucchini slices lately. 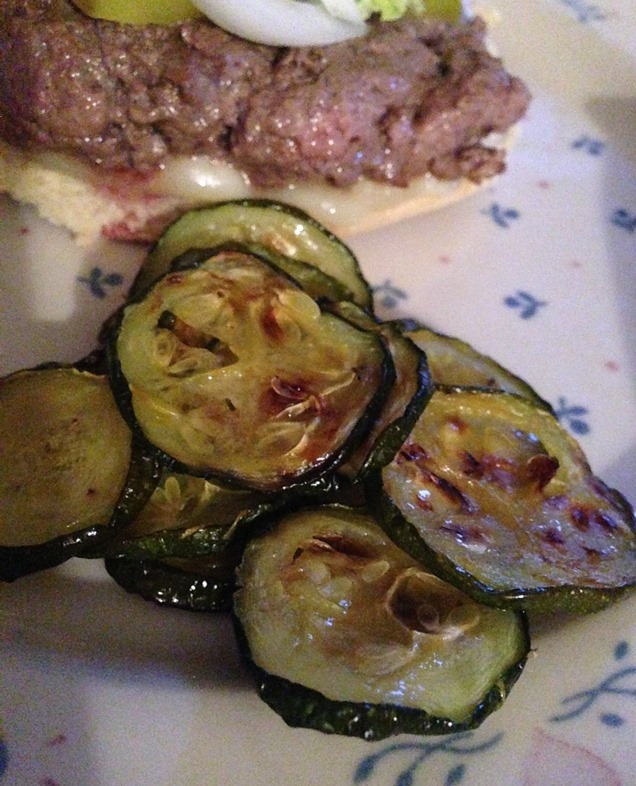 I have been just ahead of the peak zucchini season, but now it is here so I will keep on enjoying them. Do you like zucchini? How do you slice ’em? This entry was posted on June 11, 2018 at 4:34 pm	and is filed under Food, Vegetables. 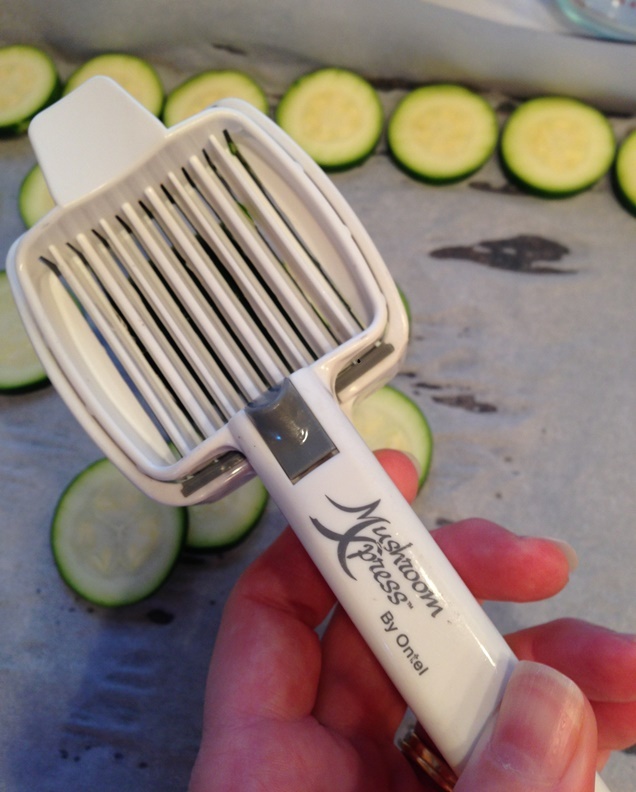 Tagged: egg slicer, life-hack, mushroom slicer, oven roasted, roasted vegetables, vegetable slicer, zucchini. You can follow any responses to this entry through the RSS 2.0 feed. You can leave a response, or trackback from your own site. Tonight , we used a spirlizer to make a zucchini dish. It was wonderful with pistachio pesto and shrimp. Oh! I have been curious to try one of those spiralizers, but I CANNOT (I mean REALLY) have another gadget in my kitchen. I hear wonderful things about them, though! Thanks for reading and commenting, Donna!